News about Father Romeo Obach made headlines after the priest did the unimaginable to a 17-year-old unwed mother at her child's baptism. A video showing him berating, insulting, and humiliating the single mom during what was supposed to be a joyful celebration on Sunday had gone viral. In his official statement, Fr. Oming admitted his wrongdoing and said sorry to the teen mother, her relatives and friends. 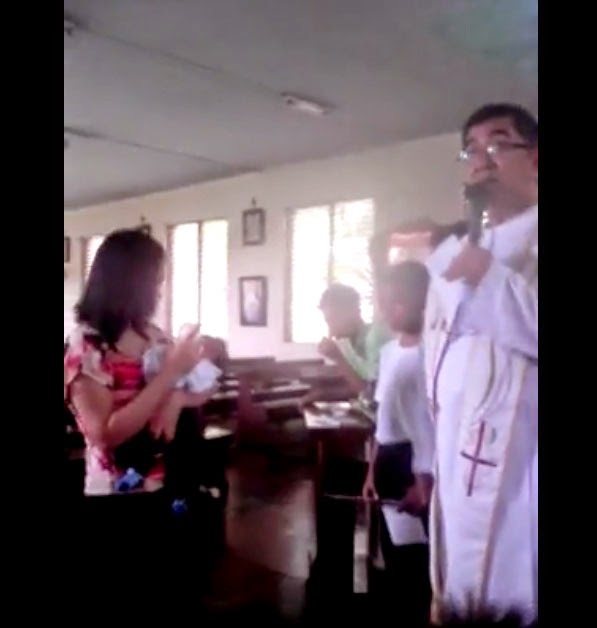 However, the unwed minor had told reporters that she's not ready to forgive the priest, saying she was deeply hurt of what he uttered during his sermon. I am now making a public heartfelt apology to the mother of the child and her immediate family. The words I said and the rude attitude that I showed before I performed the rite of Baptism last Sunday, July 6, 2014 at the Sacred Heart Chapel, Jagobiao, Mandaue City was indeed unbecoming. I deeply regret that I have done this. I only later realized how cruel my ways to educate and impart lessons for the said event. I am deeply sorry to the mother of the child, her relatives, the sponsors and the witnesses of the incident. I am sorry to the internet viewers, to media listeners and viewers for this mistake I personally admit. I am deeply sorry and I humbly ask for your forgiveness. I execute this statement of apology on this 8th of July 2014 at Cebu City. Fr. Alfonso Suico, Jr., media laiason of the Redemptorist Community in Cebu said the priest has been barred from officiating Eucharistic celebrations and other religious activities while an internal investigation is underway. 1. We, the Redemptorists of the Province of Cebu are deeply saddened by the incident that happened on July 6, 2014 at the Sacred Heart Chaplaincy in Jagobiao, Mandaue City. The said incident involved one of our confreres, Fr. Romeo Obach, CSsR. We were made aware that the incident was videoed and uploaded on social media and has since gone viral. As a religious community we DO NOT CONDONE such an UNACCEPTABLE ACT as it is contrary to the Charism and Mission for which our Congregation was founded – compassion especially to the poor and the most abandoned. We sincerely feel for the family and to them we extend our heartfelt apology. 2. An INTERNAL INVESTIGATION is underway. Rest assured that appropriate SANCTIONS on the part of the involved will be applied once the investigation is complete so that justice may prevail. 3. We will reach out the aggrieved family at the appropriate and most opportune time to address this particular matter. We respect their situation at the moment and sympathize with their hurt and anger over this matter. 4. The Redemptorist Community has always upheld the rights of the poor and disenfranchised since the first missionaries arrived here in Cebu in 1906. And this has been our conviction through the decades. It is but unfortunate that the incident involving Fr. Obach occurred, as he has been a good missionary for many years. He has served in many capacities and various places heeding the challenges of the congregation, yet he is also human and prone to lapse of judgment and imprudence. 5. We appeal for calm and sobriety from everyone even as we try to assess both the outcome of the investigation of our confrere and at the same time reach out to the family. We appreciate that if you have further concerns, address them to the SUPERIOR of the Redemptorists. 6. May this also serve as a reminder to us in the religious life and the clergy of our role as pastors: that we are called to serve and not be served and to offer our lives for all (cf. Mt. 20:28). On behalf of the Redemptorist Community of Cebu, we extend our sincere and humble apologies. Father Romeo Obach could face sanctions for what he did, but public clamor calling for the priest's resignation is apparently getting stronger.